This web page is no longer being supported, due to lack of interest by everyone (myself included). It once seemed like a good idea. 2015.06.16. This web site resumed active status after a suspension (Apr 24 to May 17). 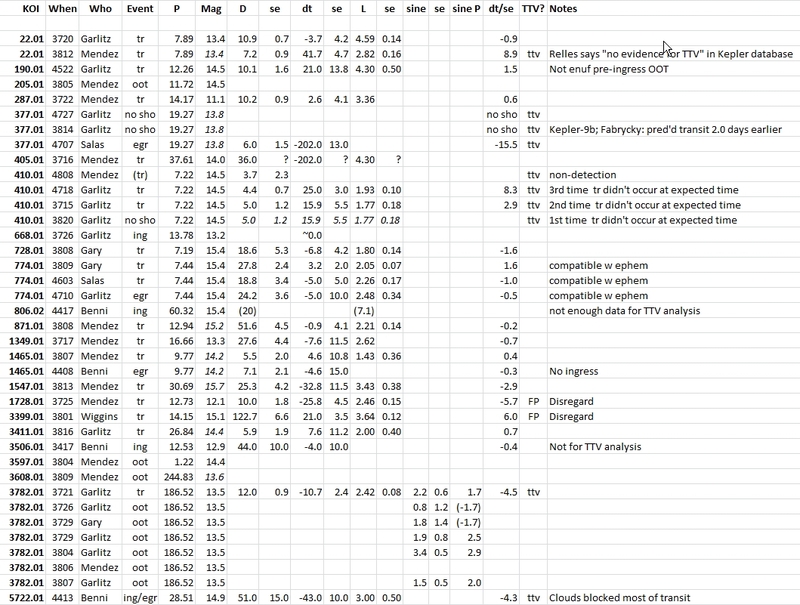 I have now reassessed the feasibility of amateur observations contributing to refinement of TTV for Kepler objects. This reassessment was prompted by an analysis by Howard Relles in April showing that most KAFO light curves weren't accurate enough to be useful for that purpose. After reviewing how KAFO was structured I found two flaws: 1) Kepler candidates with absolutely no TTV at high precision were included in the KAFO active list, and amateur observations of these objects with low precision were a "waste of time," and 2) KAFO observers were not provided guidance on which Kepler candidates were realistic for observation, based on magnitude, transit depth and telescope aperture. The new KAFO addresses both flaws: 1) only Kepler objects with known or suspected TTV are included in the active list, and 2) a graph is provided that observers can use for assessing whether an object is both bright enough and has a deep enough transit depth to be usefully observed for a specific telescope aperture. This website lists Kepler exoplanet candidates with known or suspected TTV that are observable by amateurs. The Kepler project's latest release now includes >7280 candidates; 26 of these are either known or suspected of exhibiting TTV. The "KAFO active list" will show which oof these 26 objects are predicted to have transits during a 2-week interval. Observers are encouraged to select objects for observation based on a graph showing an empirical relationship between V-mag, transit depth and telescope aperture. Long period exoplanets are emphasized because they are in some respects more suitable for a network of amateur observers than a small number of professional observers since amateurs are found at a large range of longitudes and sample a wide range of weather conditions at any desired observation time. Follow-up analysis of mid-transit times reported on this web site will be performed by Sigfried Vanaverbeke (and maybe Howard Relles), and these results will be included in a section of this web page when they become available. Figure 2 Lower-left. Guidance for assessing feasibility of providing useful timing information for a transit event based on the star's brightness, the transit depth and telescope aperture. The area above the trace is "feasible." For example, a 11-inch telescope observing a star with V-mag = 14.0 can provide "useable" transit observations when transit depth > 10 mmag (assuming sufficient pre-ingress and post-egress data are available, and the light curve quality is good in other respects). Figure 2 Lower-right. Empirically-based mid-transit time SE for a 12-inch telescope versus V-mag & transit depth (assuming a good quality light curve). For other telescopes I suggest multiplying transit depth by (12-inch/aperture) and sliding the traces right or left by amount = 2.5 * LOG(aperture/12-inch). For example, a 24-inch telescope observing a V-mag = 12.75 star (0.75 mag right adjust is for larger aperture) will have a 1.0 min SE when transit depth ~ 10 mmag. Note: naive modeling of timing SE doesn't allow for systematic effects that vary greatly with observer (reference stars used, photometry apertures used, seeing variability, etc). Actual SE values can be larger by a factor of 2 or 3 (if light curve quality is poor). The chart above is based on an analysis of previously submitted LCs. I plotted quality symbols on the V/D field and found that a trace could be constructed that separated the useable from un-useable LCs with nearly 100% accuracy. All of the attempts below the trace were un-useable (10 out of 10), and 79% of the LCs above the trace were useable (11 out of 14). Observers, try to observe the entire night (these are long period candidates which tend to have long transit lengths). Even if only an ingress, or egress, is observed, this can be useful. Combining light curve segments can be achieved if they overlap (or if same filter and reference stars are used, etc). I recommend using a clear filter (or better yet, a Cb filter, clear with blue blocking). Second choice is r'-band filter, or Rc-band filter. Third choice is V-band. Make sure the PSF has FWHM > 2.5 or 3.0 pixels (to avoid "pixel edge noise); if you feel the need to bin 2x2, and if FWHM < 3 pixels, it's suggested that you defocus to broaden PSF. Keeping the star field fixed with respect to the pixel field will reduce systematic effects, such as those related to notoriously difficult master flat fields. Anytime this can't be achieved, and star field wander exceeds ~10% of the FOV, there's no point to constructing a light curve because it is likely to be ruined by unknown master flat systematics. That's my position, and I'm sticking to it! Check to make sure the master dark frame doesn't increase noise (in area without stars); if it does, then consider using auto-optimization (I'm assuming you're using MaxIm DL). Before committing a night's observations to a target on the above list I suggest that you check the NASA Exoplanet Archive at link to be sure that the target hasn't been "dispositioned" to "false positive" status (meaning that it's probably an eclipsing binary, etc) since the time of my last downloading of the list (which I do weekly). It may also be prudent to verify the candidates RA/DE coordinates (I've made mistakes on this in the past). 4727 K00377.01 P= 19.27 d Garlitz: a "no show" during a 7-hr LC that included entire predicted transit. 4718 K00410.01 P= 7.22 d Garlitz: Late 25 ± 3.0 min; depth & length same as expected. 4707 K00377.01 P= 19.27 d Salas: Early by 3.4 hrs (assuming ephem L w SE = 0.2 hr); same depth. 4710 K00774.01 P= 7.44 d Garlitz: Compatible w ephem (-5 ± 10 min). 4603 K00774.01 P= 7.44 d Salas: Compatible w ephem (-5 ± 5 min). 4417 K00806.02 P= 60.32 d Benni: Partial ingress only; possibly late, but not enough data to be sure. 4419 K03506.01 P= 12.63 d Benni: Partial ingress only; nothing unexpected. 4408 K01465.01 P = 9.77 d Benni: Detected, but small depth (7 vs 21 mmag), same as Mendez meas'd; no ingress. 3A01 K00889.01 P = 8.89 d Gary: Confirmed ephem; slightly deeper. 3924 K03780.01 P= 27.96 d Gary: Confirmed mid-transit time; depth slightly greater. 3910 K00113.01 P=386.59 d Garlitz: Mid-transit time was 62 ± 2 min early. Recently dispositioned as "False Positive"! 3822 K00686.01 P= 52.51 d Mendez: Confirmation (tho egress was early). 3831 K01457.01 P= 8.03 d Garlitz: Confirmation of all parameters. 3821 K00871.01 P= 12.94 d Mendez: Confirmation of all parameters. 3820 K00410.01 P= 7.22 d Garlitz: No show. Needs TTV analysis. 3816 K03411.01 P= 26.84 d Garlitz: Confirm depth & mid-transit time. 3814 K00377.01 P= 19.27 d Garlitz: No show! Kepler-9bcd. It is undergoing a TTV investigation (by H. Relles). 3813 K01547.01 P= 30.69 d Mendez: Grazing transit, slightly deeper; came early (33 ± 12 min) so it might warrant TTV analysis. 3812 K00022.01 P= 7.89 d Mendez: Similar depth and length, but late by 42 ± 5 min; might exhibit be due to TTV. 3807 K01465.01 P= 9.77 d Mendez: Consistent with all Kepler ephem properties. 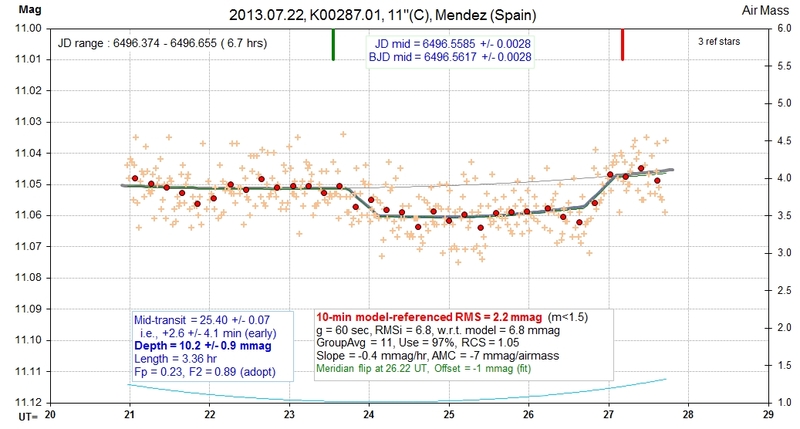 3808 K00871.01 P= 12.94 d Mendez: Confirmed Kepler ephem (0.9 ± 4.1 min early); depth 51.6 ± 4.5 vs 39.1 mmag expected. 3809 K00774.01 P= 7.44 d Gary: Confirmation of ephem; depth might be deeper (27.5 ± 2.4 vs 24.5 mmag). 3808 K00728.01 P= 7.19 d Gary: Confirmation of ephemeris; depth deeper (19 vs 8 mmag). 3806 K03782.01 P=186.52 d Mendez: OOT LC; no sinusoidal variation. 3804 K03782.01 P=186.52 d Garlitz: Variability present at ~7-sigma, but period > than before (2.9 vs 1.7 hr); similar amplitude. Puzzling! 3801 K03399.01 P= 14.15 d Wiggins: Depth much greater than catalog; it was recently dispositioned as "false positive"; we agree! 3726 K00668.01 P= 13.78 d Garlitz: Ingress time confirmed. 3726 K03782.01 P=186.52 d Garlitz: OOT; essentially no variation. 3729 K03782.01 P=186.52 d Gary: Trying to confirm Garlitz 2.2 mmag, 1.71-hr variation w OOT obs'g session; data too noisy. 3725 K01728.01 P= 12.73 d Mendez: Confirm depth & probably mid-transit time. False positive. 3722 K00287.01 P= 14.17 d Mendez: Confirm all properties! 3720 K00022.01 P= 07.89 d Garlitz: Confirm mid-transit time & depth; length is slightly longer. In the above list the entries consist of observation date (format = YMDD), KOI number, period, observer last name, brief result. The table below summarizes KAFO results (as of 2014.04.05). The "Event" column can be either "tr" for full transit, "ing" for ingress only, "egr" for egress only, "oot" for out-of-transit, and "no sho" for no show. The "D" column shows depth in mmag. The "dt" column shows observed mid-transit time minus Kepler ephemeris predicted transit time, in minutes. The "L" column shows transit length (ingress to egress), in hours. The "sine" column shows the semi-amplitude of a sinusoidal variation (when present), in mmag. The sine P" column shows sinusoidal variation period, in hours. The "dt/se" column is self evident. The "TTV?" column shows "ttv" when |dt/se| > 3, or when it was a "no show." "FP" means the candidate is a "false positive" (& shouldn't have been on my target list). The "Notes" column has miscellaneous info. All "false positives" should be disregarded. Note, we now have a detailed analysis of future transit predictions for K00377.01 by Daniel Fabrycky based on 3-body celestial mechanic integrations. K00377 is Kepler-9, and this is a famous 3-planet system discovered as such by only TTV observations by Kepler. The Garlitz "no show" on Aug 14 is due to the actual transit concurring 2.0 days earlier than the linear extrapolation of a simple fit to the Kepler-observed events (which was included in the large Kepler candidate file that I used for predicting target transits). In the future I will use Fabrycky's listing of future transit times for Kepler-9b and c (K00377.01 and .02). The Kepler Project released a database of >7000 exoplanet candidates (found at Caltech's NASA Exoplanet Archive, link in Reference section). It consists of transit properties (depth, duration, shape), transit ephemeris (transit epoch and period) and other parameters. The median period for the list is 8.6 days, with 25% exceeding 25 days; 96 are brighter than 11th magnitude. Whereas the median depth is a mere 0.4 mmag, 25% exceed 1.1 mmag and 585 exceed 3 mmag (a typical amateur capability). Most candidates have ephemeris uncertainties that are too large for TTV study because the Kepler mission was cut short by a telescope stabilizing "reaction wheel" failure. Some of the long period candidates need confirmation and refinement if they are to be useful for additional study. The Kepler telescope would have been ideal for this task since it was able to observe continuously without cloudiness downtime. A ground-based follow-up observing project can recapture some of this "observing anytime" advantage if it is conducted by a network of observers around the globe. This "Kepler Amateur Follow-Up Observations" (KAFO) attempts to achieve these goals for the most observable, and most important, subset of the Kepler list. The "observing season" for the Kepler region is centered on July 16, so this project will be conducted from early April to early October. We currently are beginning a second season of observations. 239 candidates meet the following four criteria: magnitude < 16, depth between 3 and 40 mmag, P > 7 days and Disposition not "False Positive." I have devised a "figure of merit" proportional to the product of star flux, transit depth and period. Some on this list have an accurate ephemeris, but 50% have a current transit time uncertainty exceeding 2.6 minutes and 25% have an uncertainty > 7.3 minutes. An advanced amateur observing a 20 mmag transit can achieve mid-transit time accuracy of ~ 0.5 minute, so many of the 198 candidates can benefit from amateur observations. 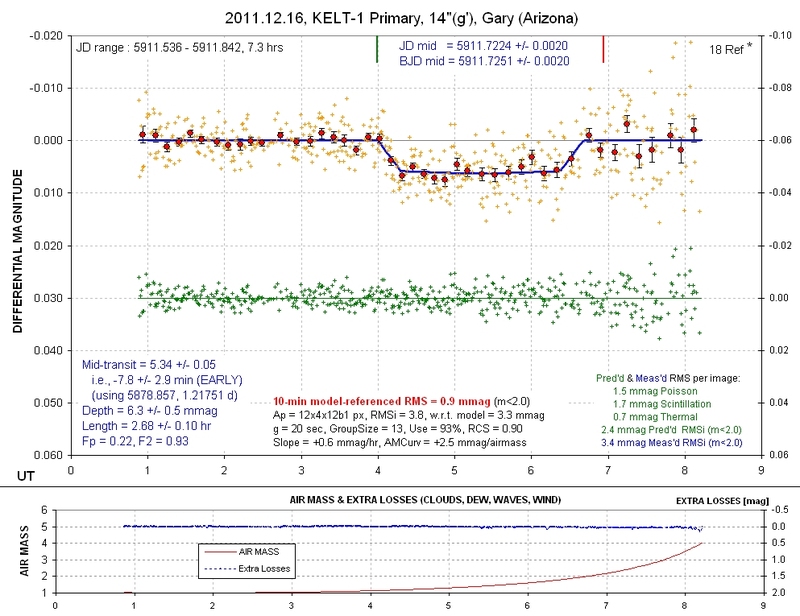 An analysis of KAFO transits by Howard Relles (April, 2014) showed that most of the light curves in the KAFO archive were useless due to excessive mid-transit time uncertainties. His plots showed clearly that the objects that showed no TTV with high precision Kepler measurements were not worth observing with ground-based amateur telescopes due to the orders of magnitude greater noise level of the amateur mid-transit times in relation to the Kepler ephemeris predicted mid-transit time. However, for those objects with known, or suspected TTV, the uncertainties of Kepler ephemeris predictions could be dramatically greater than amateur mid-transit time uncertainties - provided only good quality amateur light curves were used. This finding motivated my decision to re-structure the KAFO project in a way that guarantees that only known or suspted TTV objects are observed, and that only useful observations are accepted by KAFO. The "active observing list" will show predicted transit events for a 14-day interval, ordered by ingress time, and only for known or suspected TTV objects. It will be updated every 7 to 10 days. Observations can be reported to the webmaster, Bruce Gary (instructions below). I will record all (useful) submissions on this web page in some form, either a light curve plot or statement of observer interpretation. The LC graph may be either attached or embedded. If you don't want to send a LC graph, or a text file, then send a statement such as "No evidence of a transit in a 7-hour observing session" for example. If you send an attached text file I'll process it to produce a LC, and if it's good quality I'll post it on a web page. Here are a couple examples of transit quality using typical amateur hardware. The first one is from Manuel Mendez. It's a good example of what we can expect from modest size telescopes observing a Kepler candidate with an expected 10 mmag depth transit. Note that below the LC is a link to the data for that LC (plus other several parameters). Figure 3. data This is an example of what a modest aperture telescope can do with a typical Kepler candidate in the KAFO list. Here's another example, using a larger aperture telescope and brighter star with a 6 mmag depth transit. This is the format used for my observations (which uses an artificial star that allows for a solution for "extra losses" (beyond what a simple atmospheric extinction model fit can account for - such as clouds, dew on corrector plate, etc). Figure 4. Example light curve of a 6 mmag depth transit using a 14-inch telescope and g'-band filter for a star with g'-magnitude = 10.8, illustrating what we can expect for KAFO targets. As the information box in the lower-right corner states, the dominant source of scatter was scintillation, which explains the dramatic increase in "noise" with increasing airmass. The mid-transit time solution has an uncertainty of 2.9 minutes (lower-left information box). This LC also illustrates the type of display that can be produced when observers submit text files to the webmaster for posting on a website devoted to KAFO LCs. Mid-transit time accuracy will of course degrade with magnitude, and will also depend on transit depth. Mazeh et al, 2013 "Transit Timing Observations from Kepler: VIII Catalog of Transiting Timing Measurements of the First Twelve Quarters", arXiv: 1301.5499 (link).